So it’s Tuesday, as you know, so time for another CASEing Tuesday Card. 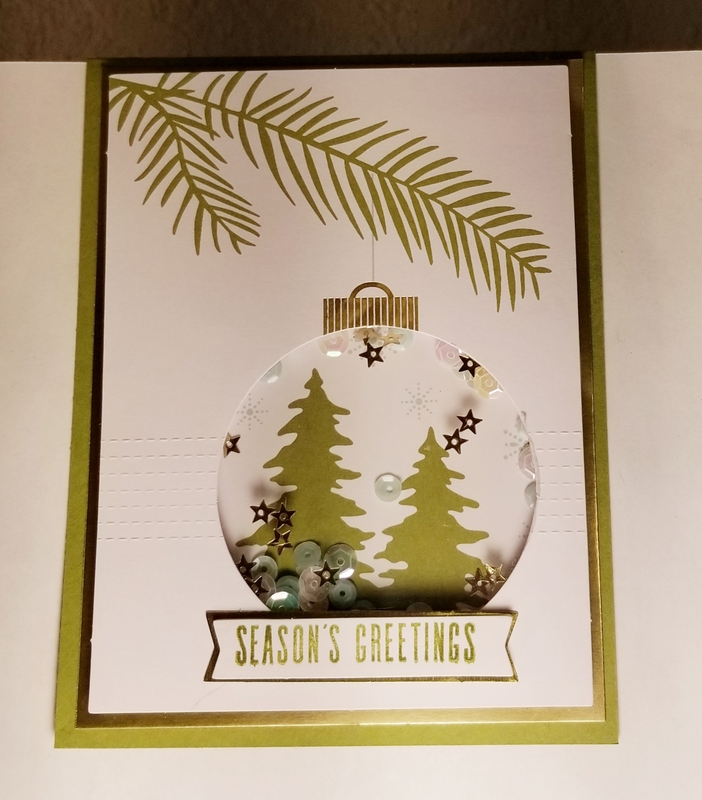 This card is based on the card on page 27 of the Stampin Up Holiday Catalog (left side, blue). I made it into a shaker card and added some layers. I also used some October Paper Pumpkin materials. Paper Pumpkin is so versatile that you can create many more items than the intended projects. To order products used to create this card and many more, see my on-line store darleneseitz.stampinup.net. Why not come and join us on the Facebook page CASEing Tuesday and see how you can create great cards based on those in the catalogs. Stampin’ Up! has released their new catalog and I hope you are enjoying crafting with some of the new products. Today, I will start a series of blogs on some of the individual products and/or suites. For today, I will be showcasing the Carols of Christmas Bundle. The set also comes with another big bold greeting Peace on Earth which is showcased in the card shown below. 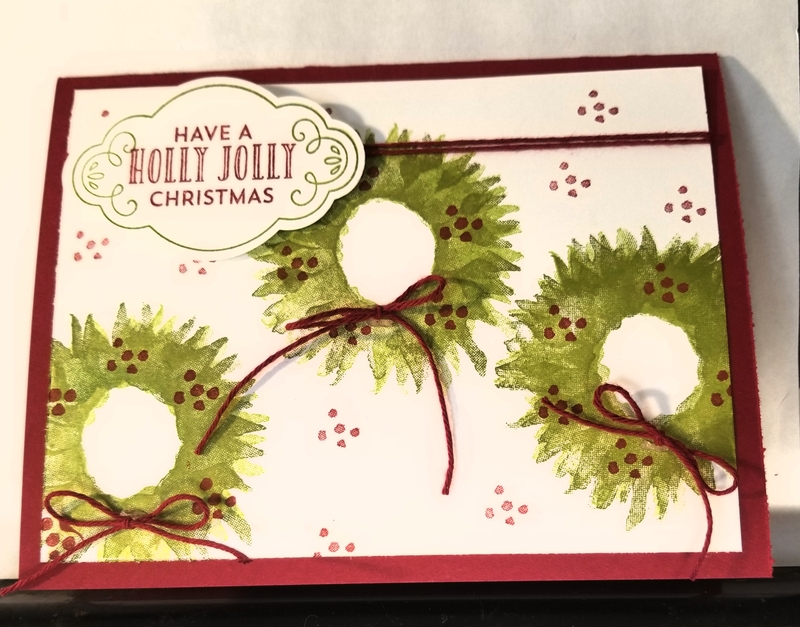 Adding small details such as the poinsettias and rhinestones with some of the fabulous new striped ribbon finishes off the card. Oh, and I can’t forget the Designer Series Paper, called Be Merry, which is actually in the Annual Catalog. (I will list all products with their product number at the end of the post). The next card is an entirely different look and uses die cut images. The sky with the moon and the stars (highlighted with Gold Foil) truly sets the card apart than just having a blank space. And this die can be used with many sets/cards and year round. DSP is used again (Be Merry) for the trees which includes white specks for a look of snow. DSP from the Naturally Eclectic pack is used for the background. The small deers are also made using die cuts. You can add any greeting you want to this card or leave the front blank and stamp the inside. I used the Peace on Earth greeting for the inside. Carols of Christmas Bundle-Clear Mount 146037 & Wood Mount 146036-Save 10% by buying the bundle. Items are also offered individually –see store for details. You will also need your basic supplies such as ink pads, cardstock, adhesive, scissors, Bigshot. Seems for me it’s never too early to start getting ready for Christmas. Stampin’ Up! is going to release their Holiday Catalog on September 1, 2017. In the meantime, The Carols of Christmas Bundle is being released early (8/1) so you can get a jump on making your Christmas cards. 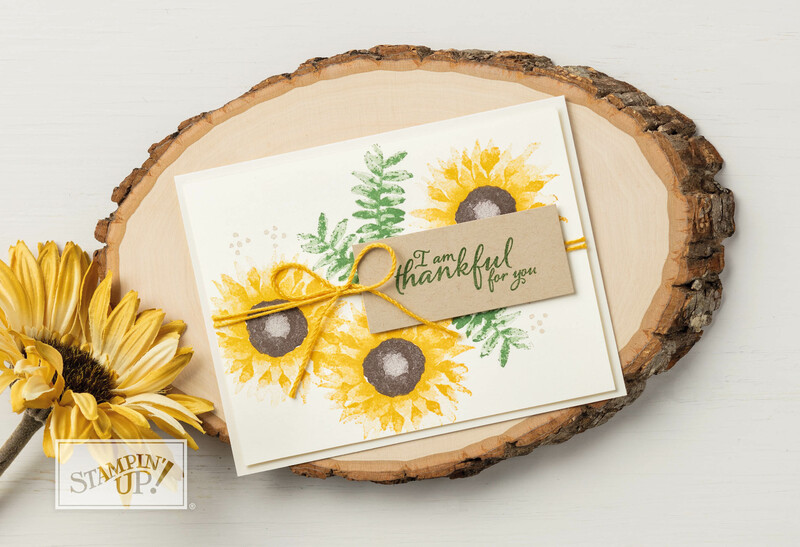 There are some neat stamps and dies that make for a wow card yet you can go simple with this set of stamps because of the large greetings. 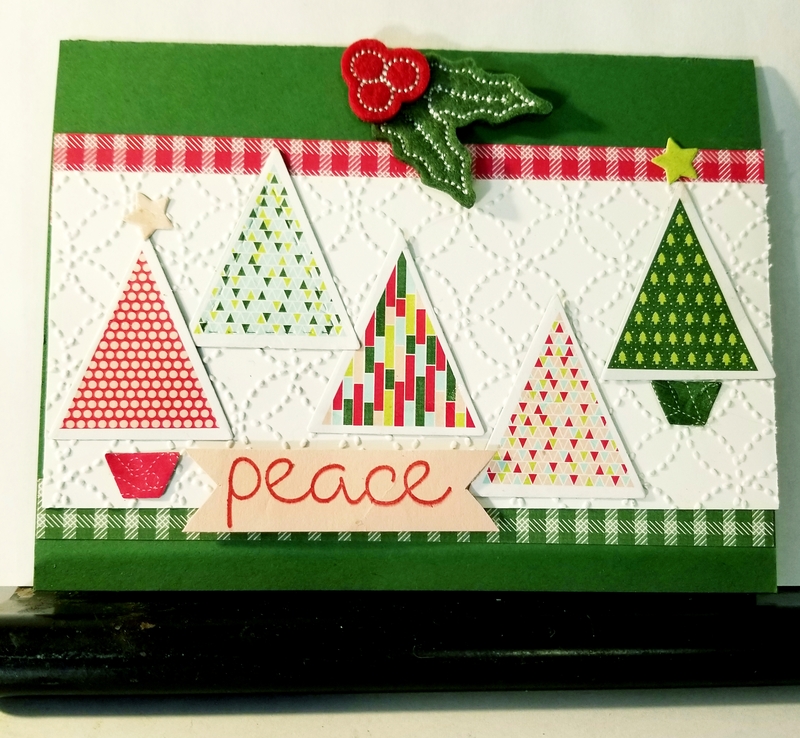 These two cards feature the Peace on Earth greeting. They both also use the trees. The one on the right is a shaker card and also uses the sky/moon/stars die on the top. The one on the left is a fairly simple one which would be perfect for mass producing cards. 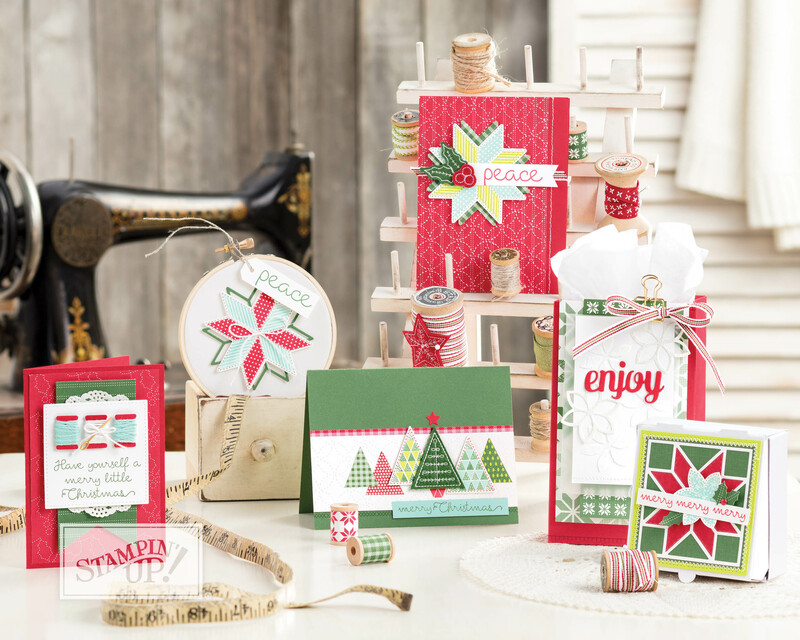 These two use the Deck the Halls greeting and the border which is a real versatile die that could be used all year long. The one on the left is a good idea for using the set with your family picture included. Vellum cardstock is used for the top layer and can be picked up so your friends and family can see the picture more clearly. These products can be ordered separatly or as a bundle and you save 10% when you bundle. 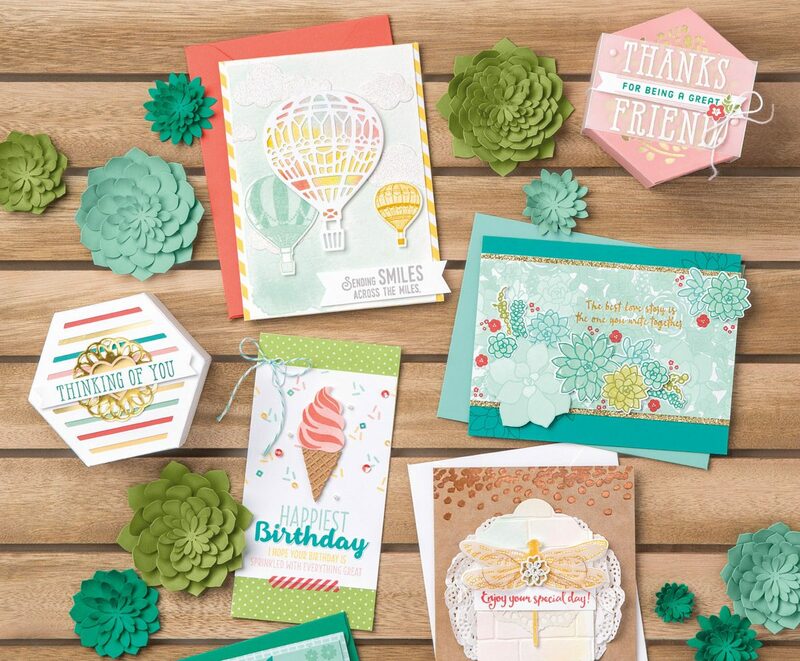 Visit my on-line store at darleneseitz.stampinup.net or contact me today at darstz@hotmail.com. You can also leave a comment on this blog. Thanks all for today…I have to get back to making some Christmas cards using Carols of Christmas.